Can Dogs Eat Jackfruit - Or Is It Bad For Them To Share? Can Dogs Eat Jackfruit As A Treat? Is It Something They Can Digest Easily, Or Is It Even Dangerous For Them To Consume? 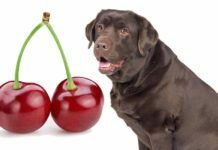 If You’re Thinking Of Sharing Your Fruit With Your Pooch, Then Check Out This Complete Guide To Dogs And Jackfruit To Find Out! 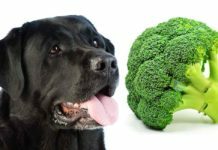 While some dogs can be picky eaters, many other dogs seem keen to eat anything that fits into their mouths – whether it is edible or not! If your dog is in the former category, you probably have nothing to worry about food-wise. But if your pup falls into the latter group, you may have already had an adventure or two as your dog explores his world the way most dogs do – with his mouth! Jackfruit is a newer entrant to the exotic fruits section at many grocery stores and farmers markets. The first time you see a jackfruit, you may not even realize it is a fruit because it looks so strange with its hard lime green rind covered in tiny bumps. 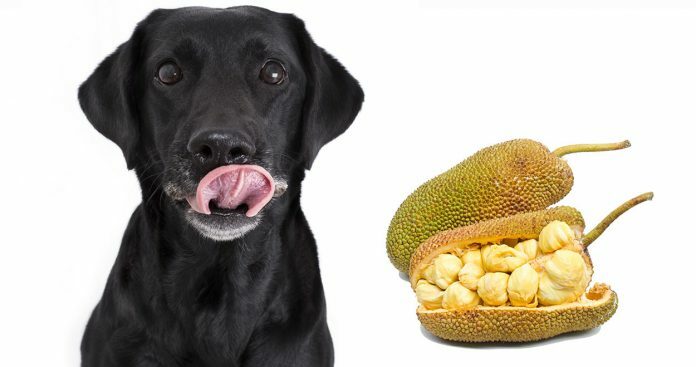 Because jackfruit is becoming more popular and more mainstream, the question of can dogs eat jackfruit is something all dog owners need to be able to answer. In this article, we are going to take a look at dogs and jackfruit to give you the information you need! Before we address the question ‘can dogs eat jackfruit’, let’s find out a bit about this new addition to the fruit basket. The texture of jackfruit is substantial and starchy, with a crunch when unripe and more of a firm pudding-like consistency when ripe. Jackfruit also has large seeds, which can also be consumed boiled, roasted or ground into a flour but never raw. Raw jackfruit seeds contain a substance called a “trypsin inhibitor,” which basically means they are indigestible. Jackfruit is low in calories (95 calories per one-half cup of raw fruit). It is high in water content yet low in sugar. Jackfruit is packed with fiber (one-half cup of jackfruit contains 20 percent fiber). It contains calcium, potassium, iron, magnesium, thiamine, vitamin B1-B2-B6, vitamin A, vitamin C, vitamin E, folate, manganese, riboflavin, niacin, sodium and zinc. It is packed with phytonutrients and antioxidants – protective compounds that are thought to decrease cancer and high blood pressure risk. It’s main protein compound, Jacalin, is thought to improve immune system function in humans. But there is still a lot we don’t know about jackfruit as well, including whether it is truly one hundred percent safe to offer to your precious pooch. Can dogs eat jackfruit? The short answer is…. probably. But let’s look at why it’s not a straight-forward one. Starting with the human side. Jackfruit is considered quite healthy for people to eat. In fact, in some Western food health circles, jackfruit is being hailed as a “miracle food” for people because of its high nutrient and fiber content plus its low caloric and sugar content. But while jackfruit is a relatively new discovery in the States and the UK, jackfruit has been a nutritional staple for at least 6,000 years in India and Asia where both people and animals eat it frequently. In these countries, jackfruit trees grow in abundance and the fully ripe fruit can weigh in at more than 100 pounds. Jackfruit flesh (pulp or fruit) can be eaten by humans both raw and cooked. It can also be eaten whether unripe or ripe. When harvested unripe, jackfruit is not at all sweet and can be easily used as a meat substitute, similarly to how tofu or tempeh is used in vegetarian “meat” dishes today (fans say unripe jackfruit has a noticeably meaty texture that is quite similar to pulled pork). When allowed to ripen before harvesting, jackfruit is mildly sweet (some say it tastes like a cross between a banana and a pineapple, or a stick of Juicy Fruit brand gum) and can be eaten on its own or blended into a dessert. But can dogs eat jackfruit in these quantities or this safely too? Jackfruit, Artocarpus heterophyllus, hails from the same plant family as do figs, mulberries and breadfruit. Figs in very small quantities (1 or 2 small figs per serving) are considered safe for dogs, although they are known to cause upset stomach in some dogs. Mulberries are considered non-toxic to dogs. Breadfruit safety for dogs has not yet been addressed directly, but breadfruit does have an appearance and nutrient content that is quite similar to that of jackfruit. NOTE: “Breadfruit” and “Mexican breadfruit” are NOT the same plant and are not related to one another at all. 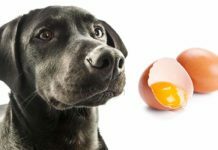 The latter is a known toxin for pets, including dogs. Now let’s take a look at other animals that appear to safely eat jackfruit. Horticultural and biological research tells us that many insect pests adore eating jackfruit. Livestock such as cattle will eat the leaves and the fallen ripe jackfruit, and jackfruit is sometimes deliberately added to livestock feed to fatten cattle up. Wild exotic mammals such as the coati, monkey, Indian giant squirrel and marmoset have been observed dining on fallen ripe jackfruit, as have deer, hares, rats and other wildlife. But can dogs eat jackfruit seeds too? Thus far, we have been examining whether the flesh (pulp) of the unripe or ripe jackfruit is safe for dogs to eat. Research doesn’t give us a definitive answer one way or another. However, we now know that jackfruit has a potentially nourishing nutrient content. We also know that a variety of other domestic and wild animals appear to be able to eat jackfruit safely. But can dogs eat jackfruit seeds? General veterinary guidance suggests that most fruit pits and seeds are toxic to dogs if ingested. We also now know that the raw jackfruit seeds are indigestible. Jackfruit seeds are also quite large. One single seed can measure anywhere from three-quarters to one and a half inches long and anywhere from one-half to three-quarters of an inch wide! 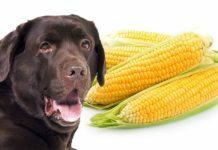 Seeds of this size can present a considerable obstruction hazard, especially if you have a smaller breed dog. If you do decide to let your dog sample jackfruit, it is advisable not to allow her to consume any of the seeds, even if they have been cooked. So we know jackfruit seeds are a bad idea, but can dogs eat jackfruit latex? On the outside, jackfruit appears to be rigid, spiky, firm to the touch. On the inside, it is a whole different story. This latex makes fresh, raw jackfruit quite difficult to work with. In people who have a latex allergy, this substance can also be extremely dangerous and perhaps fatal. To date, there is only one reported case of jackfruit anaphylaxis, in a human female patient who ate dried jackfruit and later tested positive for both latex and jackfruit allergies. 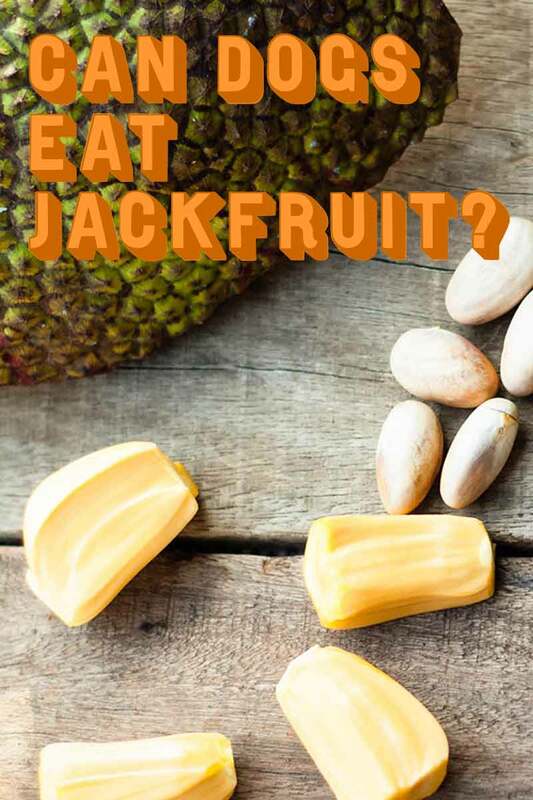 If your dog has a history of atopic dermatitis (eczema) with a suspected connect to latex, or if you are simply not sure, it is best to not feed your dog any part of the jackfruit, even the flesh (pulp). Either way, jackfruit latex is best avoided. But what about the rind? Jackfruit also poses another potential hazard that is obvious the moment you touch it, which is that this fruit has a very hard, thick outer rind, or hull. The outer hull of the jackfruit is nothing short of formidable, with its firm, thick exterior loaded with hundreds of small, rounded spikes. It is not hard to understand why wild animals wait for the ripe fruit to fall off the tree and smash open on the ground before they try to eat it! But can dogs eat jackfruit rind safely? Your dog won’t have any idea that this intriguing large green item came from a tree in Asia. She won’t know that the hull and seeds are literally indigestible. She may just think you got her a great new chew toy, and one that is particularly challenging! If your dog does manage to chew through the jackfruit hull and then swallows pieces of it, this could create a serious obstruction situation that could possibly be life-threatening. It is one thing to deliberately permit your dog to sample a bit of jackfruit flesh. It is quite another thing to discover your dog happily chewing away at a jackfruit you never intended for him to sample! If you find yourself in this situation, you should always give your veterinarian a call and follow any guidance you are given. 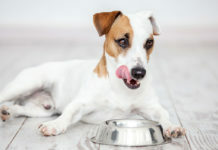 You may be told to simply observe your dog, paying particular attention to excessive thirst, persistent diarrhea (due to the high fiber content) or the appearance of itching or a skin rash. Or you may be advised to bring your dog in for a check-up, especially if you think he has swallowed jackfruit seeds or rind. So can dogs eat jackfruit? The complete answer is that it will depend on the dog. Your dog might be able to eat small portions of jackfruit flesh (pulp) safely, but we don’t have any guarantees. In terms of portion size, keep in mind that one-half cup of jackfruit is considered one serving for an adult person, and the average adult person weighs 181 pounds today. If you do decide to offer your dog a taste of jackfruit flesh, be sure to reduce the portion size accordingly based on your dog’s body weight. 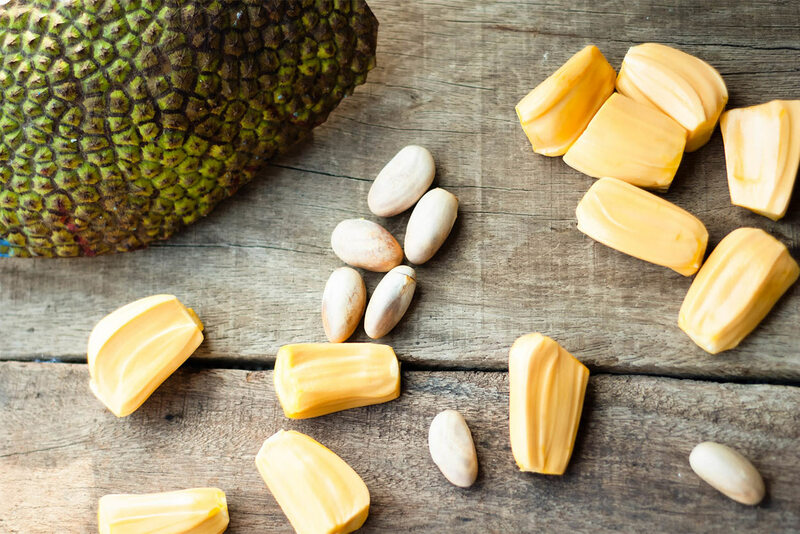 There are other fruits that are safe for dogs, so unless you really want to serve your dog jackfruit, you may find greater peace of mind just leaving it off the canine menu altogether. Silver, M., “Here’s the Scoop on Jackfruit, a Ginormous Fruit to Feed the World,” NPR, 2014. Stukin, S., “Is Jackfruit the Next Big Meat Substitute?,” National Geographic, 2016. Thakor, N.J., et al, “Jackfruit and Its Many Functional Components as Related to Human Health: A Review,” Comprehensive Reviews in Food Science and Food Safety/Wiley, 2012. Roque-Barreira, M.C. et al, “Jacalin: an IgA-binding lectin,” The Journal of Immunology/National Institutes of Health (NIH), 1985. Morton, J.F., “Jackfruit: Artocarpus heterophyllus/Fruits of Warm Climates,” Purdue University, 1987. NSRC Editors, “Jackfruit (Artocarpus heterophyllus),” Wild by Nature/National Standard Research Collaboration, 2015. Wongrakpanich, S., et al, “Jackfruit anaphylaxis in a latex allergic patient.,” Asian Pacific Journal of Allergy Immunology, 2015.